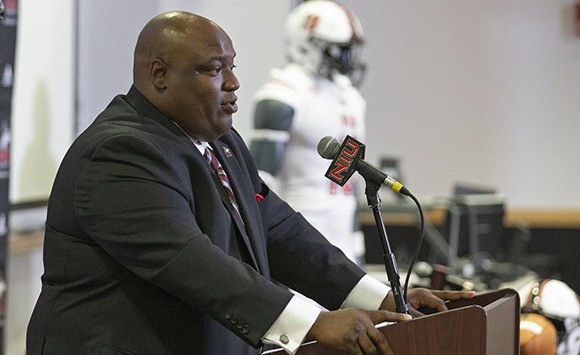 There is so much more than football that could explain the love and regard new NIU head football coach Thomas Hammock, ’02, has for his alma mater. New NIU head football coach Thomas Hammock speaks at his inaugural press conference. Hammock took Novak’s words to heart as he was a two-time CoSIDA Academic All-American (2000, ’01) and a two-time Mid-American Conference (MAC) All-American Selection (2000, ’01) at running back. He earned his bachelor’s degree from NIU in marketing in 2002 and has a master’s degreee in educational leadership and policy analysis from the University of Wisconsin-Madison, graduating in 2004. Now that Hammock has been afforded the opportunity to guide the NIU football team, Novak’s mentorship is not lost upon him on the recruiting trail of future Huskies. “Every parent wants to know how I am going to take care of their son,” Hammock said. “The number one thing we’re going to do is make sure that they graduate. “That’s important to me as the head coach: to make sure that kids come here to get a degree that’s valuable and important and that they can use beyond football,” Hammock continued. “We never know when football is going to end. Hammock will not hesitate to mention to recruits about his academic plaudits and his NIU degree. “If I can trust you in the classroom, I can trust you on the football field,” Hammock said. “I don’t just talk about it, because I’ve done it and I’ve lived it. Long before Hammock was recruiting prospective athletes, he was perfecting his sales pitch in front of his future wife, Cheynnitha, in front of Douglas Hall as NIU freshmen. Cheynnitha earned both her bachelor’s and master’s degrees from NIU. That memory helped name their son, Thomas Douglas, who joined his older sister Tierra. It has been five years since Hammock has been involved in the actual recruiting process as a collegiate coach, as he served as the running backs coach for the Baltimore Ravens from 2014 to 2018. If Hammock’s past is any indication, the NIU Huskies will be built with student-athletes and not athlete-students. Eui-kyung Shin, a professor of Social Studies Education in the Department of Curriculum and Instruction, is celebrating the publication of a new book. Natalie Andzik and Xiaodan Hu were selected to participate in the Principal Investigator (PI) Academy, sponsored by the NIU Division of Research and Innovation Partnerships. Joseph Flynn, associate professor in the Department of Curriculum and Instruction, received the O.L. Davis, Jr. Outstanding Book Award for 2018.